Stunning Birthday Card Anyone Will Love To Receive. This happy birthday card is a joy to make and I'm also very sure, a joy to receive. Well, how do you like to receive this stunning birthday greeting card on your birthday? If your answer is 'Yes', then you should make one or more like this and keep them ready to send out to a birthday person. This greeting card design is rather versatile. You can send it to just anyone and it will still be suitable and appropriate. So why not make some today? Chocolate color cardstock 12" x 6"
Die-cut Paper 4.5" x 6"
Pink color cardstock 1.5"x 6"
Hi! Want to see more Happy Birthday Greeting Invitations and Cards? Check out my Oh Happy Birthday website. Pour clear embossing powder over stamped image and shake off excess powder. Heat to melt powder with heat gun. Apply glue to pink cardstock. Attach to left side on the front of folded chocolate colour blank card. Use a sponge to apply colour to the die-cut paper. I prefer polyester fiber because it is easier to blend the color. Apply glue to the die-cut paper. Attach to the right side on the front of folded chocolate colour blank card. Align the pink colour card-stock and the die-cut paper to each other. Apply glue to ribbon and paste over the joint between the pink colour card-stock and die-cut paper. Fold the both ends of ribbon to the inside of card. Viola! 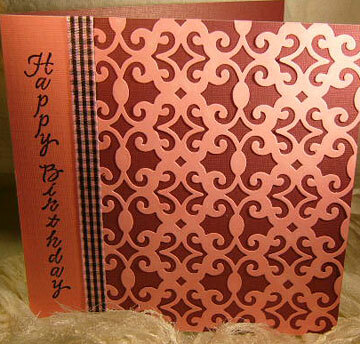 A stunning pink and brown birthday card. Hope you like it.